The leaflet alerted all those involved in or complicit with the destruction of Khan al Ahmar and the displacement of the community about the fact that the destruction is a clear violation of international law, amounting to a war crime. The leaflet further warned that people would seek all possible legal avenues, including in international courts, to find redress against this violation of their rights. The activists went to the nearby military settlement of Beit El, handed over one of the leaflets to the soldiers guarding the entrance of the illegal settlement. 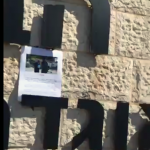 The soldier was so confused, she failed to stop the activists who peacefully entered the settlement in order to attach flyers at one of the walls. They then turned towards the exit, distributed more leaflets to cars and buses and headed away before any harm could be done to them. This action was an ironic response to Israel's own actions. Israel had distributed leaflets to the residents of Khan al Ahmar, activists returned the courtesy. The leaflets of the Israeli military ordered the people of Khan al Ahmar to destroy their homes and buildings - nothing less than their entire living and livelihood structure - by themselves before October 1. Otherwise, Israeli military would destroy the community. The leaflet ended with a phone number to a helpline in case anybody wanted support in destroying their homes.